Solar expert Finlay Colville recently presented the 2018 ranking of solar cell producers. In a nutshell, Chinese PV companies strengthened their position, in line with Beijing´s NDRC plan to dominate specific global growth industries. 1. About ten years ago the Chinese PV industry accelerated global expansion and strengthened the vertical value chain within China (module, cell, wafer, ingot, poly). But they still faced strong competition from high-quality pure cell producers in Taiwan, Japan and Germany and from thin-film specialists such as FirstSolar (U.S.). 2. Soon after, the Japanese and German producers were outcompeted via costs. Over time, even Taiwanese cell producers such as Hanwha Q-CELLS were unable to keep pace with the extremely fast expansion plans of their (mainland) Chinese competitors. 3. In the next step, even Chinese pure-play cell producers such as Tongwei and Aiko set up a blistering pace of investment with multipes of 5 GW factories, disregarding any risk of oversupply and financial losses. 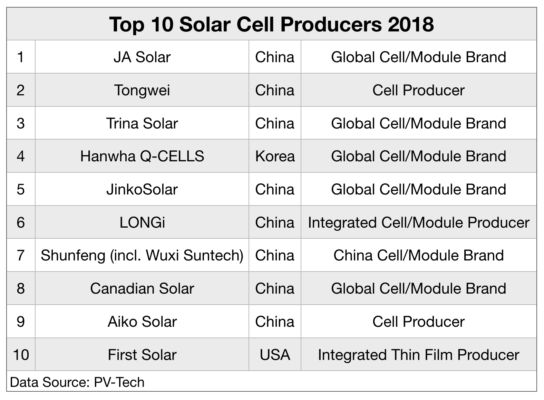 Today, the chart shows that 8 out of the Top 10 PV cell producers are Chinese companies, joined by Hanwha Q-CELLS (Korea) and First Solar (U.S.). Four of the Chinese Top10 players (JA Solar, Trina Solar, JinkoSolar, Canadian Solar) are global module suppliers with well-known brands, covering almost the entire product range from p-multi to mono PERC cells. They have large in-house cell production capacities and buy additional cells from the likes of Tongwei or Aiko. Hanwha Q-CELLS also features a well-known brand and Korean-style conglomerate strategies. LONGi Solar follows a slightly different path and features a highly integrated value chain from ingot to module. Shunfeng, on the other hand, is a large cell/module producer mainly confined to the Chinese market. Investment limitations have so far delayed a shift from older product types to more efficient products. Tongwei and Aiko pursue a strategy of extremely rapid expansion of cell capacities with 20 GW each. This will put pressure on competitors worldwide and may prevent cell prices to rise for some time to come. Tempe/Arizona-based First Solar (U.S.) is the only important thin-film solar cell producer worldwide. The industry is at several technological crossroads: the switch from multi to mono crystalline products is already in full swing. The step from p-type fo more efficient n-type (and PERC) products is only starting and mainly supported by Chinese policies (Top Runner). If n-type production is mastered at reasonable cost and at gigawatt level, a large investment wave may start. But the timing is still unclear. However, Colville hands his personal technology award not to Chinese c-Si cell makers, which follow a low-risk technological path mainly developed by Western competitors some years ago (PERC, AI-BSF), but to U.S. thin-film specialist First Solar. The company last year managed the switch to Series 6 product lines. It now occupies a unique position both in terms of products and manufacturing and may improve its Top10 ranking in 2019. But the progress of the (from a Western point of view) “last man standing” does not alter the overall picture: The fight is over – Upstream PV from silicon to modules has become a Chinese industry.